When I originally told my mom I'd be coming into some pork blood for sausage making, her first question was, "Will you be making Kiszka?" Kiszka is a polish blood sausage, and much like kielbasa there's a number of variations in amounts of meat, species of meat, types of spices, and cooking methods. This is a basic Kiszka recipe of blood, buckwheat groats, and meat, called Kiszka kaszana popularna from the Marianski/ Gebarowski book "Polish Sausages." Compared to a French Boudin Noir or Spanish Morcilla, polish Kiszka often contains a large quantity of meat trimmings and skin. These tough cuts of meat and skin require extended cooking that would normally make blood grainy and mealy. So to start, the pork skins, pork trimmings, and beef are all cooked separately, until the meat is tender and the skin is soft and gelatinous. While the meats are cooking, I sauteed some onions cooked in lard. I then toasted the buckwheat groats to help emphasize their nutty flavor. 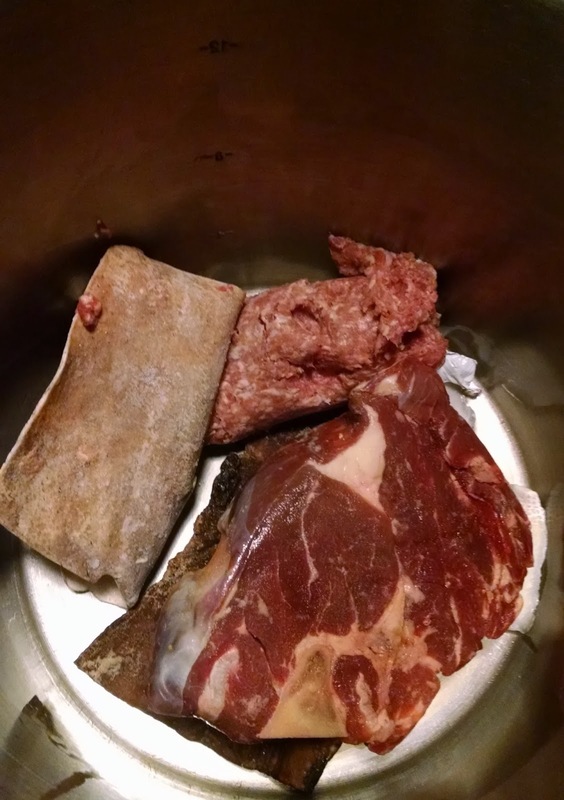 Once the meats were cooked, the buckwheat went into the meat's poaching liquid. Precooking the buckwheat is essential. The last thing you'd want is for the buckwheat to cook and swell inside the sausage casing, ripping and bursting apart. Now with the buckwheat gently simmering the meat gets cubed up and chilled. Grind the (now chilled) meat and skin through a fine die, and combine with the cooked (and also cooled) buckwheat, onion, and a bit of fresh garlic, black pepper, salt and marjoram. 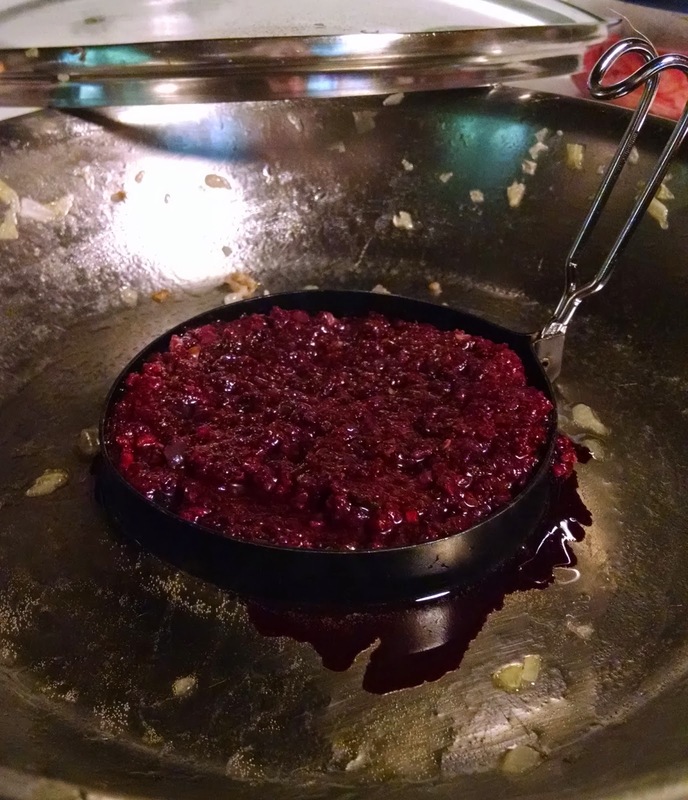 I added three pints of blood and stirred to spread the blood through the meat/onion/buckwheat mixture. This is a pretty soupy mixture, so I really couldn't fry up a small patty to taste the seasoning. A small egg ring actually worked out pretty well to make a mini "Kiszka pancake"
A bit more pepper to adjust the seasoning and I was ready to case it up. Being so loose and slurry-esque, I just tied off one end of the casings and poured the mixture in with a funnel. Occasionally an obstinate onion would need to get poked down the funnel mouth with a chopstick, but it actually worked very well. Just like with a boudin noir, the kiszka is poached right after stuffing into casings. This helps to set the blood and keep all the denser ingredients (meat, skin, and buckwheat) from separating out from the blood and sinking to the bottom of the sausage. 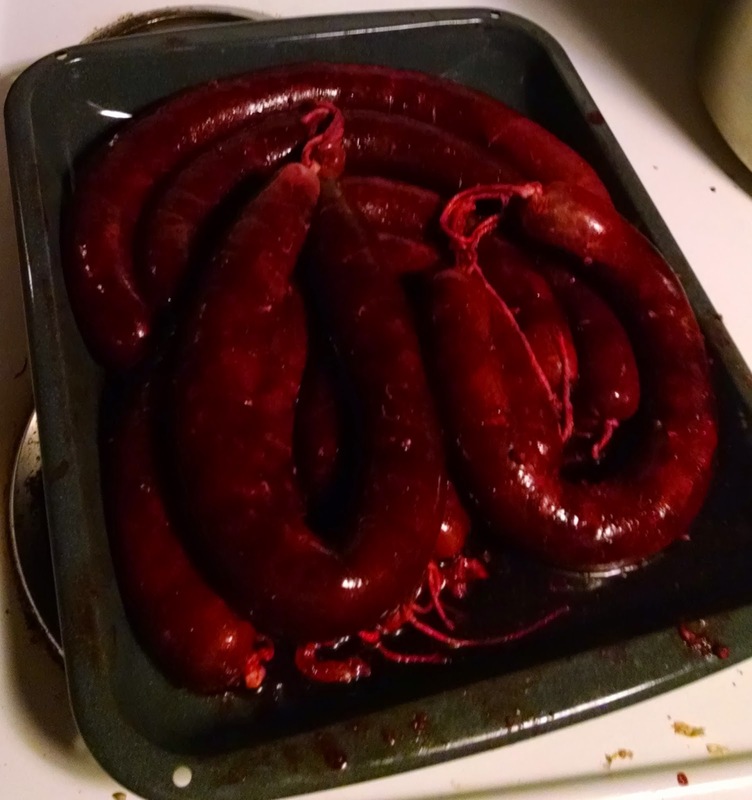 Again, like boudin noir, I found bringing a 3 gallon pot of water to a boil, then turning off the heat and dropping the sausages in worked perfect. The large thermal mass of the water was hot enough to cook the sausages through, but gentle enough keep them from bursting. There's a good drop in temperature once you add the sausages, so you may need to bring the heat up a bit to stay at 160 F if you're poaching in a smaller quantity of water. Serving up a larger platter of Kiszka, my mom said it reminded her of the holidays when she'd pick up the locally made sausages from the butcher in her hometown of Weirton, West Virginia. Compared to boudin noir, kiszka has a bit more of a crumbly texture, due to the ground meat, skin, and buckwheat. 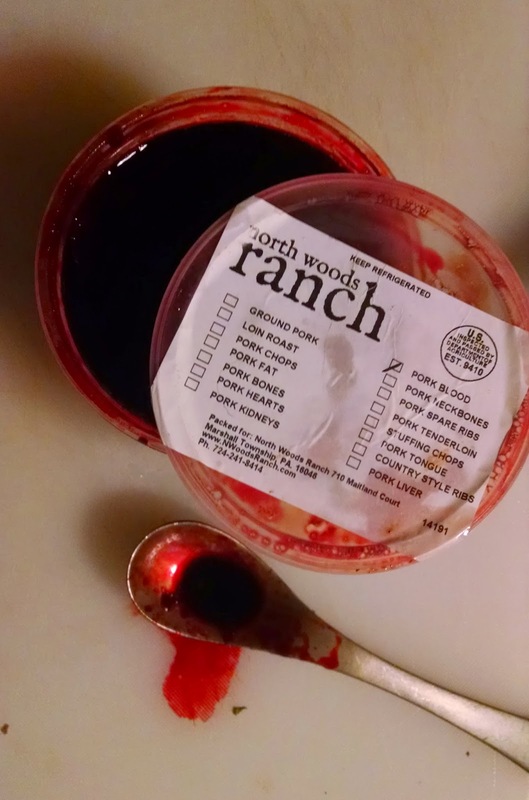 It doesn't have that smooth, pudding-like texture of boudin noir, but it brings a much heartier flavor and toothsome texture to the table. Perfect for a cold night with a steaming platter of sauerkraut and a bowl of horseradish-spiked sour cream.